Whether you are hoping to sell up and put your home on the market within the next year, or you are fed up of a dull and unwelcoming home exterior, spending time every few years revamping the outside of your home can be incredibly rewarding. Not only does a visually appealing, neat and tidy property create a positive first impression for visitors, but will also instantly improve your mood the moment you arrive home. When it comes to improving the inside of your home, we are overwhelmed with new, unique interior design trends, but there is often little inspiration for the exterior. So, to get your brain flowing with exciting ideas, we’ve devised a list of our top tips on how to improve and modernise your home. Similarly to any form of home improvement, there are both luxury, costly ideas and others that are a little more cost-effective. Luckily, a smaller budget doesn’t necessarily mean that you have to compromise with half-hearted jobs to fit your price bracket, you can make just as much impact with smaller scale improvements here and there. All of our ideas can be done on a variety of budgets, and can be perfectly tailored to your property. Your choice of front door colour and style can make or break the exterior of your home, and there are a few essential factors to take into consideration before you opt for a change. A full front door replacement can be booked if you want to add glass panels, or alternatively, you can use your DIY skills and instead give it a fresh lick of paint. Red, green, black, grey and white are just some of the most common colour choices when it comes to front door options. Always take into consideration the colour of your neighbours’ doors, along with whether your home is brick, stone or panelled. Your front door withstands its fair share of wear and tear, so must be adequately prepared and painted with a weather resistant paint if you do go down the DIY route. For a full guide on how to paint your front door, head over to Classy Clutter. Building a porch is the most costly of our upgrading ideas, however, it is exceptionally effective and dramatically increases the value of your home if you decide to sell up in the future. Porches are not only fantastic for creating additional storage, but they also create a welcoming and enticing feel. It is an excellent way of adding character to your property and standing out from the crowd, particularly if you are the only home in your neighbourhood to opt for this popular extension. Expert help from your local, professional builders in Milton Keynes will need to be enlisted to make an extension to your home. They will have the knowledge and skills to ensure that the porch fits seamlessly into the exterior of your home and is a long-term investment that will involve no future issues. Once your porch is fitted, it’s time to enjoy your new space. We highly recommend that you keep this area light and airy, using neutral colours and avoiding a buildup of clutter. There is nothing worse than approaching a home to see a porch filled with shoes, bags and jackets! Instead, opt for simple, discrete, multi-purpose storage options such as shoe box seating. You’d be pleasantly surprised of the vast difference that high-quality lighting can make to the exterior of a property. While strolling through large new-build cities such as London, you will notice that the majority of modern homes will have lantern-style lighting fitted either over or at the sides of their front door. This alone is an excellent way of adding a contemporary touch to your home, not to mention the added visibility at times on those darker days. The Lighting Company have a fantastic selection of different outdoor lights, for both a traditional and modern style home. Try to steer clear of large, extravagant lights as they can often look out of place and take away from the simple yet effective look. There are many different types of exterior lighting options available, some more eco-friendly than others. You can opt for a light that uses solar panels, one that is activated by sensors or a generic choice that is manually switched on and off from inside the home. With a busy schedule between work and other commitments, it can often be tricky to find the time to maintain the flowers and plants surrounding the exterior of your home. Front gardens are usually small and border with either pathways or roads, making it unlikely that you will spend a lot of time there. Homeowners are more eager to transform their back garden rather than front simply due to the amount of time they spend there over the warmer months. Recruiting the help of a team of landscapers is perfect for taking the hassle of maintaining your garden off your shoulders. When you opt for landscape maintenance, there are a variety of different services to choose from, such as grass cutting, weeding, tree maintenance and even leaf clearances. Along with making the exterior of your home look immaculate and attractive, landscapers can also remove any moss or leaves that are building upon pathways or around your entrance. Windows frames are prime culprits for collecting moss, mould and rot, which alone, makes your home seem incredibly unappealing. The best way to remove all grime from window frames is to mix vinegar and hot water in the 1:4 ratio and spray onto frames. Leave to soak for up to ten minutes and then all dirt should wipe away. On the other hand, unfortunately, your windows may need to be replaced altogether to improve the look of your home. If you find it difficult to open or close your windows, you continuously seem to have condensation, or they can no longer block out noise, it is time to look for replacements. For more signs that you need to look into replacing your windows, take a look at this useful PCW article. Lastly, a great way of adding a decorative touch and a vibrant splash of colour to your home is to replace the house name or number that is placed outside your property. Although appearance is important, the primary goal of a name or number is to make it easy to locate your home in a row of the same properties. A thick, clear font in a primary colour is always preferred over a thin, italic font, which may look elegant but is simply not effective. For an extensive range of different house name and number options, take a look at The House Numberplate Company. LED lighting is the perfect way to spruce up your home. In the upcoming years, it has become increasingly popular within both houses and commercial properties. Not only does it have a positive effect on the visual appearance of your home, but it has an impact on your energy bills, and the amount of money you spend. LED bulbs are a lot more efficient than standard light bulbs, they have a longer lasting life and are not as prone to blowing as standard light bulbs. 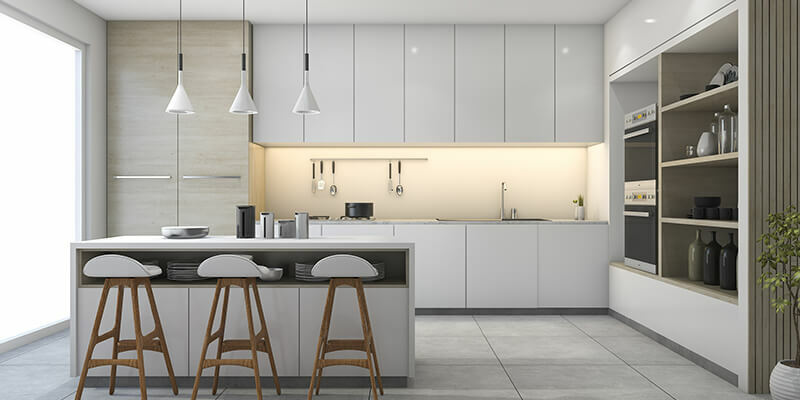 As well as this they provide a better quality of lighting, the lights are considerably brighter and can be purchased in a variety of colours if you wanted to modernise your home with mood lighting. We would recommend Philips Hue mood lighting kit to get you started off, they can transform the appearance of your entire home, and can help you relax and unwind. Worn out paint or peeling wallpaper can make your home look worn out and in desperate need of a makeover. Replenishing your home with new wallpaper or paint is one of the simplest and cost-effective ways that you can modernise your home. When choosing your wallpaper or paint colours, be sure to look at modern home designs. This way you can get an idea of what you want your home to resemble, and at the same time have guidance on how you should go about everything. Remember also to take into account the design of the rest of your home, if your living room is grey, try and stick to the same design pattern or you could end up with your property having a mish-mash of designs. To keep up with home design trends, we recommend looking on sites such as Pinterest and home design blogs, this way you won’t only get inspiration but you can update your home to the current trends. If you are looking to update your home with some new wallpaper, we recommend staying away from busily patterned and floral designs, as these can make your home appear dated. Remember that trends don’t stick around for long, so if you find something that you like, perhaps try and find a more subtle version in order to stay stylish even when the trend fades out. One wallpaper design that is on trend is wallpapers with geometric style patterns and lines, although this may sound unappealing, when put into a home it is fantastic at creating a modern home design without making your home appear dark and dingy. We love this wallpaper design form I Love Wallpaper, the Zara shimmer metallic wallpaper is perfect for recreating a modern design in your home and is available in 5 different colours to suit your home style. One of the most popular things to do to modernise your home and create more room is to get a home extension. Home extensions may seem like a lengthy and costly process, but it’s worthwhile to add value to your home property and add extra room. A lot of people typically invest in home extensions to create added living space in your home. As well as this, you can get yourself on the property ladder with an investment like this. Homebuyers are always looking for homes that have more living space, a home extension could be your key to selling your home quickly. But the main thing is that it can be a great investment to modernise your home. Homebuyers nowadays are frequently looking for modern homes as they seem to be more sought after. If you can make your home look modern and well presented, it will be a great place to live and you will have no trouble selling it. Another main use of home extensions are for recreational purposes, for example, games rooms, gym rooms or playrooms. If you have one of these in your home you are instantly going to stand out from standard homes that don’t have amenities like this. Home cinemas and games rooms are a very modern home improvement, therefore by adding one of these you are bringing your home up to date and making it more contemporary. If you are thinking of investing in home extensions, we would recommend talking to your local builders Newport Pagnell in regards to costs and the extensions process. We hope that we have given you some helpful tips and inspiration on how you can not only improve, but also modernise your home. As mentioned previously, you do not need to pay out a huge chunk of money to achieve a revamped outcome unless you want something large like a home conversion or extension, just a little extra work and some design inspiration! For any more help regarding architectural drawings Towcester or other home improvement services, please feel free to contact a member of our team today!